A veterinary oncologist is a veterinarian with advanced training and expertise in the diagnosis and treatment of cancer. 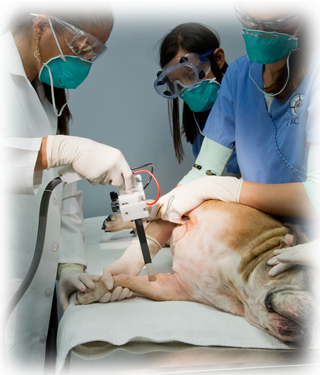 At CVRC, our oncologist is also trained in the use of ultrasound to help in diagnose and stage your pet's cancer. A veterinary degree (three to four years of undergraduate college, followed by four years of veterinary school). One year rotating internship in veterinary medicine and surgery. Three years of advanced oncology training (residency). A series of rigorous examinations covering all aspects of general internal medicine and veterinary oncology. Oncology, the treatment of cancer, involves surgery, chemotherapy, electrochemotherapy, radiation therapy or a combination of these methodologies. Unfortunately, cancer is quite common in our animal companions, with 50% of dogs over age 10 and 1 in 4 of any age developing cancer. Thus, it is crucial for pet owners to be diligent and not take a “wait and see” approach when it comes to lumps and bumps on their pets. If diagnosed early enough, the majority of tumors can be kept in remission for a very long time, or even cured in some cases. Our goal is not just to prolong life, but to maintain good quality of life, and each visit to CVRC is centered on making sure your pet is still participating in things they love to do (chasing squirrels, playing Frisbee, or taking walks with the family). Chemotherapy in animals is MUCH different than in humans. We use much lower doses of chemotherapeutic drugs and are committed to the idea that the treatment of cancer should NEVER be worse than the cancer itself. Chemotherapy is used to treat cancer at the tumor site, as well as the cancer that has potential to spread throughout the body. Most chemotherapeutic drugs act directly on cancer cells, preventing them from maturing or reproducing. Chemotherapy protocols are frequently changed or customized to achieve the best outcome for your pet. Immunotherapy is the use of the body’s immune system to treat a disease. Immunotherapy is used to treat certain cancers. There are various types of immunotherapy ranging from cancer vaccines to injecting cytokines (chemicals that stimulate the body’s own immune system). Electrochemotherapy is a new treatment option for tumor control that delivers trains of electrical pulses to cancer cells shortly after injection of chemotherapeutic drugs. The pulses open pores in the tumor cell membranes making them more permeable and enabling better penetration of anti-cancer drug molecules to increase tumor cell kill. Surgery is the oldest form of cancer therapy and has cured more patients than any other treatment method. This great success is mainly due to the development of new surgical techniques combined with chemotherapy and other treatment modalities when indicated, for a comprehensive treatment plan for your pet's cancer. Oncology consultation usually begins with your family veterinarian diagnosing, or being suspicious of, a disease or condition that requires advanced expertise, diagnostics, therapeutics, and patient monitoring. A full history, medical record review, and complete physical examination are performed. After examination and discussion, an initial treatment plan will be presented for the diagnostic workup and/or treatment. How much does it cost for a consultation with the oncologist? What is 'staging' and why is it important? Depending on the nature of your pet's condition, the diagnostics or treatments performed, and their timing, your pet may or may not need to stay overnight. Overnight stays are uncommon for our cancer patients. Our oncologist will discuss the expected hospital stay during your visit or admission to the hospital.